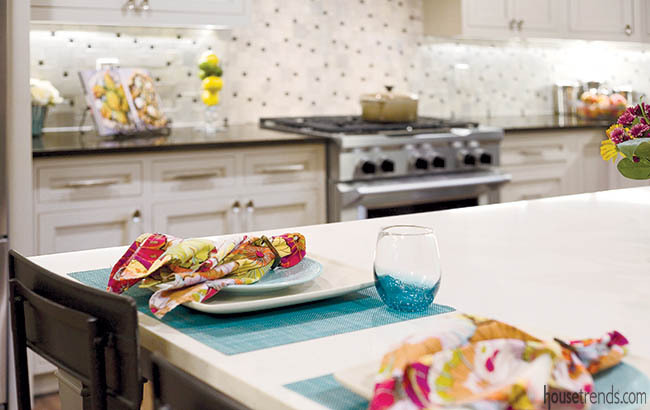 A large quartz countertop provides plenty of room for these homeowners, whether they’re entertaining a crowd or spreading out ingredients for meal prep. As you step through the entry hall and into the spacious kitchen of this Chagrin Falls home, a calming wave of blue rolls over you, lowering your heart rate and releasing the tension in your body. 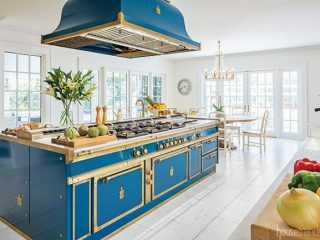 From the light blue walls to the dabs of navy and whispers of taupe in the backsplash, the color scheme dominates the entire space. And space, there is. 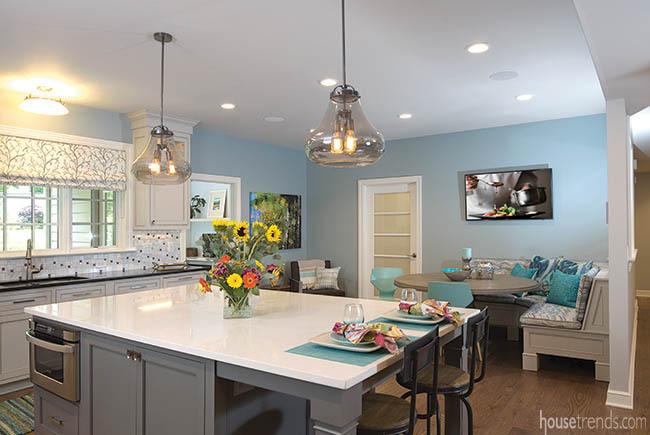 High traffic volume should never be a problem in this flowing kitchen, as guests can casually migrate from the kitchen island to the curved banquette to the bar-height dining table, and finally into the inviting great room. 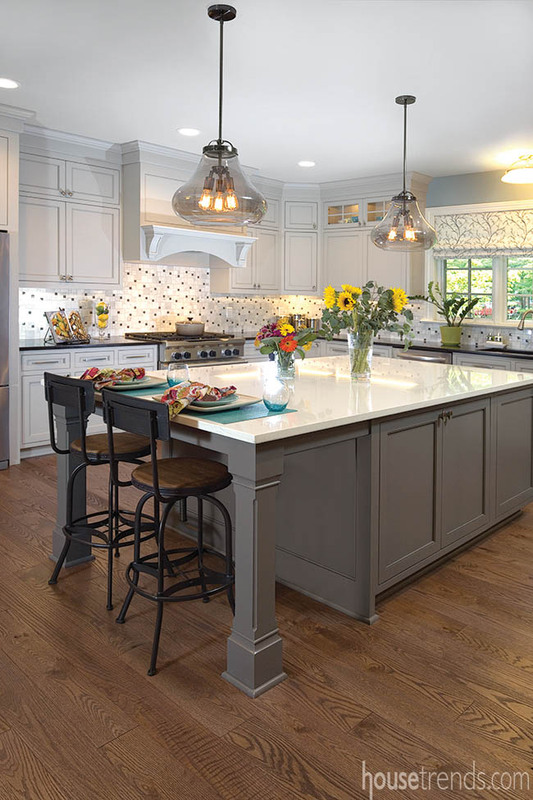 The most notable thing about the kitchen island is its sheer size, although it does offer many other amenities. 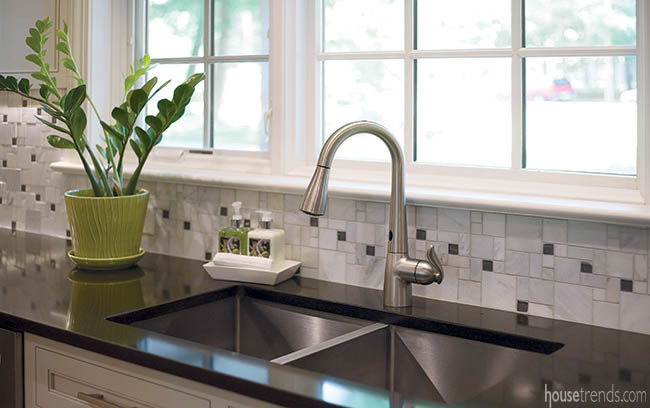 “We used to joke about dance parties on top of the island,” laughs Joan Hanslik, who wore two hats for this project: tile designer for Thomas Brick, the company that supplied all of the tile and stone in the home, as well as interior designer. The middle of the island is hollowed out and used for storage, something that there is plenty of, in this spacious culinary haven. Both upper and lower cabinets line two of the perimeter walls—a good thing as the wife likes everything to have a place and to be neatly put away in said place. A frosted door next to the banquette hides a pantry, a cavernous closet that holds everything from cooking supplies to small appliances. And, as the wife eagerly points out, there’s an additional clean up station located behind the door. 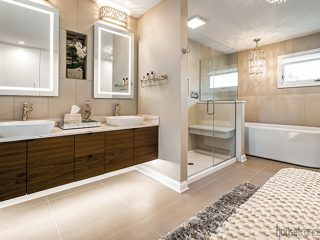 This allows the owners to entertain in the ever popular open-living style, but not have to force their guests to awkwardly mingle nearby as they’re elbow deep in sudsy water cleaning up the dishes. The mess can be tucked away and dealt with at a later time. 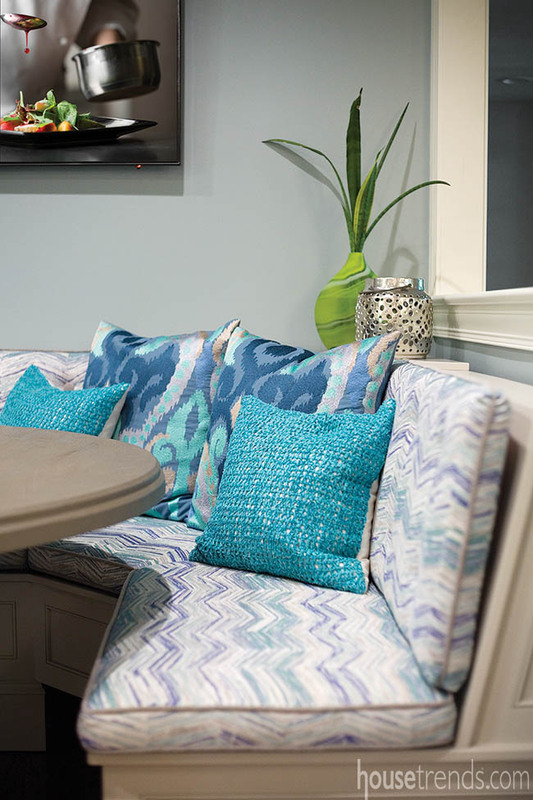 The tile leads the eye on a merry dance across the kitchen, past the open office door and to a small corner seating area: a plush chair dotted with colorful throw pillows. This is a favorite resting place for their dog, a playful pooch who likes to perch anywhere padded. 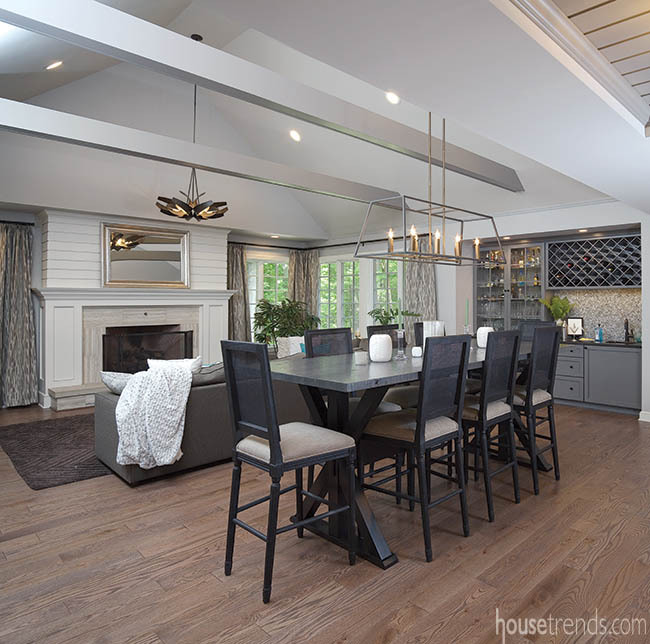 Smooth red oak flooring with a custom stain runs underfoot, connecting the kitchen and dining space to the great room. Carved into a convenient alcove that can be easily accessed from the kitchen, dining area and great room, the bar has something for every palate. 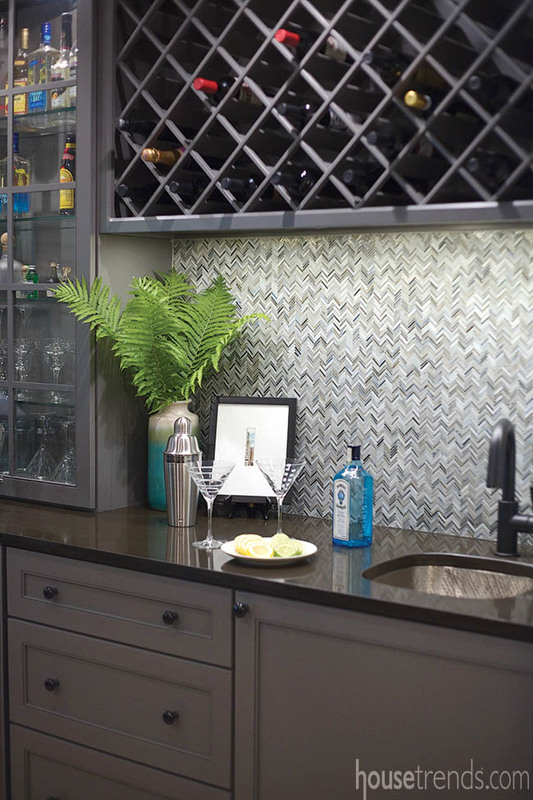 Angled nooks provide tantalizing views of the stored bottles of vino, while liquors and mixers stand at attention in the glass-encased cabinetry right next to it. 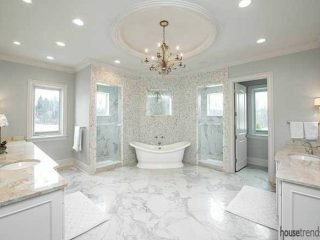 In the master bath, a different kind of calming color palette is used. Gone are the soft blues and eye-catching teal accent pieces; this space is all about warm neutrals. 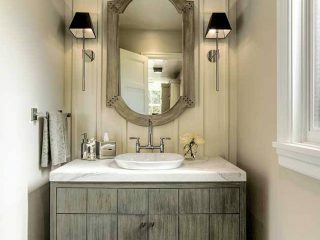 Reminiscent of a high-end spa, the gorgeous light fixtures shine delicately on two separate vanities, a luxurious tub and a large shower. 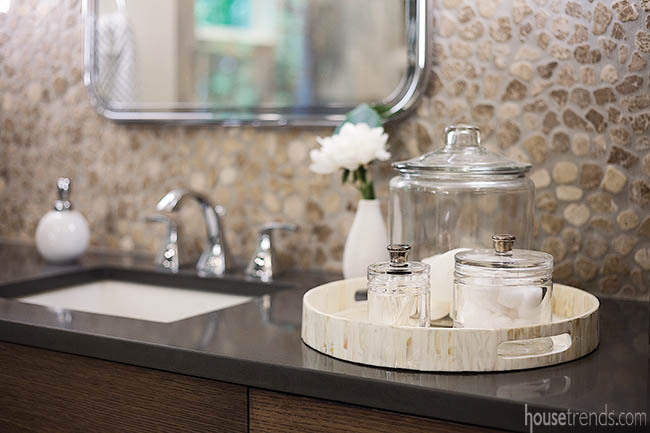 The finished home is a delightful combination of casual design and elegant accents, a look that’s welcoming to any and all that step through the front door.